Apollo is a gorgeous White & Blue Brindle. He is 8 years old and kennelled with Pandora! They do make a stunning couple! They are loved up and whilst he is a large boy, Pandora is 'the boss'! 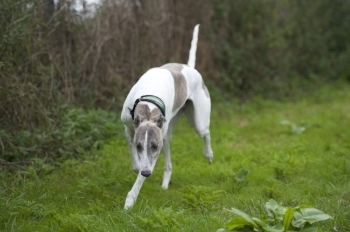 As with Pandora, Apollo is an ex coursing greyhound from Ireland and is extremely strong and is on the sponsorship scheme as we have not found the right person/people yet to take on this pair, as they must be rehomed in a pair. The simple reason being is that they are so strong and because of their hunting background in Ireland, they will need someone who is very, very experienced in the breed and strong enough to keep a good hold of these two. Apollo as like Pandora, does like his own breed and larger dogs but no smaller dogs or cats etc again due to his background. He loves people and children but we must again stress we would only consider 'older, children due to the strength of these dogs. They are a special pair but will remain on sponsorship until the right home comes. Older PostMeet Billy The Brave - Still looking for his new home? !